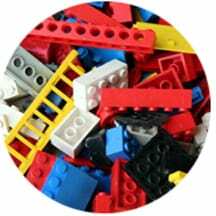 This engaging toy brick art exhibition encourages visitors to discover building concepts through interactive stations featuring LEGO bricks. The exhibition includes gallery furniture shaped like giant toy bricks, over 100 pounds of LEGOs and Duplos and LEGO education soft bricks. 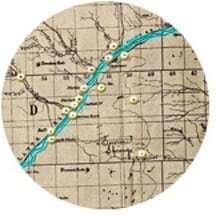 Did you know Weld County’s original territory was so vast it encompassed seven other modern counties? Explore Weld County towns past and present in this free-standing informative panel exhibition. “Awakening Stories of Ancient Bison Hunting” explores different ways of knowing ancient bison hunting practices on the Colorado High Plains. 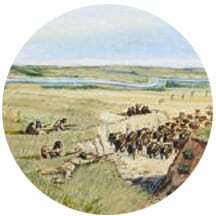 The exhibit focuses on the Kaplan-Hoover Bison Bonebed, a bison-hunting site located near Windsor, Colorado. Archaeological research by Dr. Lawrence Todd (CSU) dates this hunting event to 2,700 years ago during the Late Archaic Period and recognizes it as the single largest bison hunt known in the Americas for its time. Awakening Stories is sponsored by the Northern Colorado Chapter of the Colorado Archaeological Society, and was made possible through grant awards by Colorado Historical Society – State Historical Fund, Colorado Endowment for the Humanities, and Colorado Archaeological Society. The first American political cartoonist, Thomas Nast is perhaps best known for his invention and development of symbols like the Republican Elephant, Democratic Donkey, a fat, jolly Santa Claus and a lean, goatee-wearing Uncle Sam. Harper’s Weekly was Nast’s most important forum and the leading illustrated American magazine of the last half of the 1800s. Nast’s support of U. S. Grant in his Republican bid for re-election to the presidency in 1872 and his offence at some of H. Greeley’s actions inspired the illustrator to create cartoons horrifically critical of Horace Greeley, Grant’s Democratic opponent. Greeley won only 40% of the popular vote, losing the presidency to Ulysses S. Grant. In the following month Greeley’s health declined and on November 29th, 1872, he died. 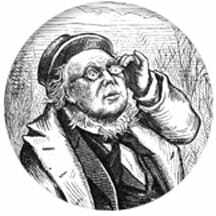 One friend claimed that Greeley had been “crushed by the unmerciful ridicule Nast had heaped on him.” The exhibition includes 20 framed reproductions of Nast’s cartoons targeting Horace Greeley, accompanying labels, and seven informational panels.